After three days of travel through space, the astronauts and the three Apollo spacecraft—command module Columbia, the Service Module, and the Lunar Module Eagle—entered orbit around the Moon on July 19. 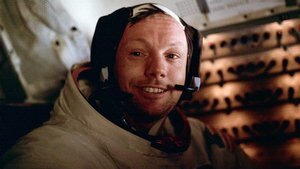 During the flight to the Moon astronaut Michael Collins had repositioned the Lunar Module so that Columbia and Eagle were joined at their respective hatches. Over the next day the astronauts readied the Lunar Module and themselves for the descent to the Moon. On July 20, the first human exploration of another world was about to begin. On July 20 astronauts Neil A. Armstrong and Edwin E. "Buzz" Aldrin and the Lunar Module Eagle touched down at the Moon's Sea of Tranquility. Emerging from Eagle astronauts Armstrong and Aldrin explored the surface for 2 hours 32 minutes, as Michael Collins remained in lunar orbit inside the command module. During this exploration, they deployed two experiments as part of the Early Apollo Scientific Experiment Package and collected 21 kilograms (46 pounds) of lunar samples for return to Earth. The Lunar Module (LM) was launched from Earth in a compartment of the Saturn V, below the command and service modules. 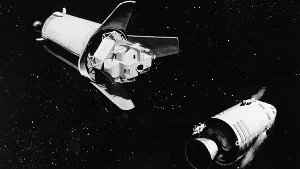 Once the spacecraft were on their trajectory toward the Moon, the command module pulled the LM from its compartment, and the two traveled together until they orbited the Moon. The astronauts lived in the command module. 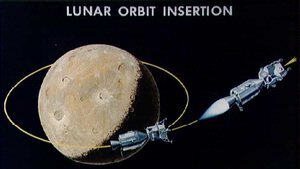 Because lunar modules were designed to fly only in the vacuum of space, they did not have to be streamlined like an aircraft or carry a heat shield for protection during reentry. They were built to be left on the moon. 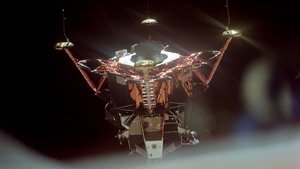 Once a lunar module was launched into space, it could not return to Earth. To prepare for the lunar landing, two of the astronauts donned their protective spacesuits and moved to the LM. 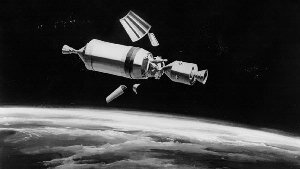 The lunar module was undocked from the command module, where one astronaut remained in lunar orbit, monitoring the activities of his colleagues. The two astronauts in the LM fired its descent-stage rocket engine. Directing the craft toward the surface; the astronauts controlled the descent rate to ensure a smooth touchdown. 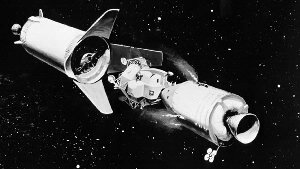 The descent engine supplied the power for the complex maneuvers required to fly the Lunar Module from orbit down to a soft landing on the Moon. 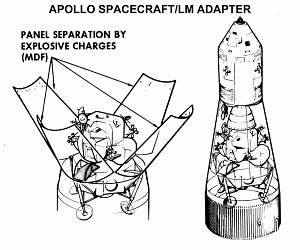 The engine was fired as a retrorocket to slow the Lunar Module, allowing a controlled descent to the surface. The thrust of the descent engine is controllable within a range from 476 to 4477 kilograms (1050 to 9870 pounds). 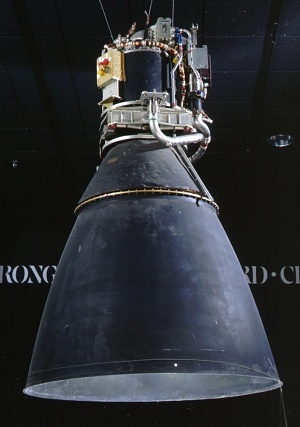 The descent engine burns liquid propellants: the fuel is 50% hydrazine and 50% unsymmetrical dimethylhydrazine; the oxidizer is nitrogen tetroxide. 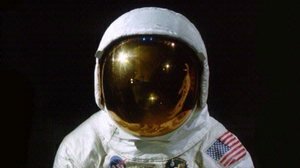 To leave the craft once it was on the Moon, the astronauts attached lunar visors to their helmets and life support systems to their suits before they exited through the door hatch above the ladder. 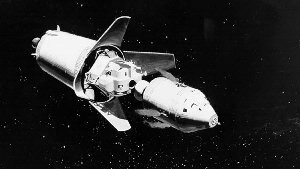 The descent engine supplied the power for the complex maneuvers required to fly the Lunar Module from orbit down to a soft landing on the Moon. 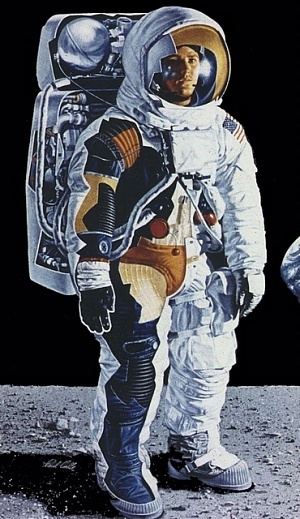 Extravehicular Mobility Units (EMUs, or space suits) were worn by astronauts when they were outside of the spacecraft. These are the suits worn by Armstrong and Aldrin during the first human exploration of the Moon. The suits are made of a white, non-flammable material called beta cloth, a Teflon-coated fiberglass. Armstrong and Aldrin wore gloves and helmets, which were securely connected to the suits where the red metal rings on the suit are. The astronauts' overshoes (worn only on the Moon) and portable life-support systems were left on the lunar surface to reduce launch weight. These suits were individually tailored for Armstrong and Aldrin and were manufactured by ILC Industries, Inc. This space suit type, used on Apollo 11, with an attached primary life support system (PLSS) weighed about 81 kilograms (180 pounds) or 13.6 kilograms (30 pounds) in the reduced gravity of the lunar surface. The torso is custom-fitted with convoluted joints at the shoulders, elbows, wrists, hips, knees, and ankles. Entry to a suit was through a rear pressure-sealing zipper that ran from the upper back through the crotch. The suit was made from 25 layers of protective materials. An Apollo lunar explorer needed to be able to walk over the rugged terrain of the Moon in a pressurized suit, pick himself up unaided should he stumble, and perform work requiring manual dexterity. 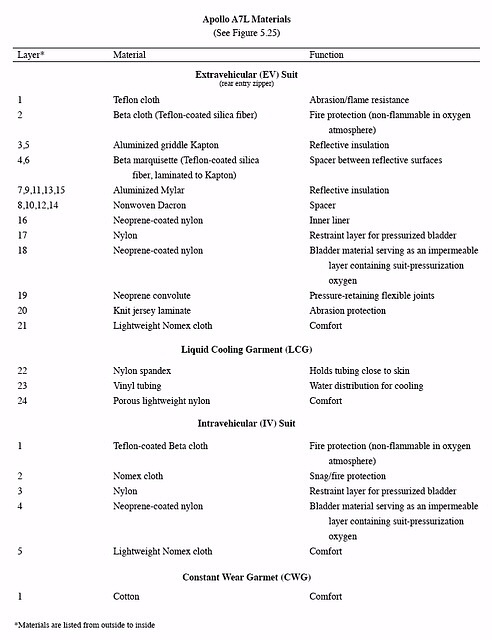 All of these criteria led to a design of a self-contained, light, flexible suit, but one sturdy enough not to rip or tear, during rigorous activity. The space suits used by Neil A. Armstrong and Edwin (Buzz) E. Aldrin Jr. during their historic July 20 and 21, 1969, walks on the lunar surface, had to protect against space hazards and yet allow the astronauts mobility and dexterity. The suits protected astronauts against micrometeoroids and temperatures ranging from -150°C to +120°C (-250°F to +230°F). 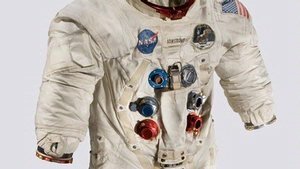 Many textiles used in space suits were invented prior to the space program. The Du Pont Company developed neoprene synthetic rubber in 1932, almost thirty years before the first manned spaceflight. Nylon and Teflon were invented in 1938. Following World War II, Du Pont introduced Mylar, in 1959, Lycra spandex fiber, and in 1963, Nomex. All of these materials were used in the Apollo space suit. Following the tragic Apollo 1 fire, researchers sought materials more resistant to very high temperatures. In 1962, the Dow-Corning Company produced Beta silica fiber, a material like fiberglass, except that it would not irritate the skin of the wearer. For the outer covering of the Apollo space suit, Beta silica fiber was coated with Teflon to create Beta Cloth. 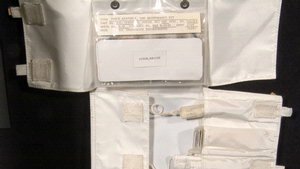 Apollo and Skylab astronauts had this kit to make minor repairs to their Extravehicular Mobility Units (EMUs, or space suits). It contains cloth tape, exterior patches, sealant bladder repair material, optical surface cleaning and defogging pads, and replacement gaskets. The command and lunar modules carried such kits on all of the Apollo Moon missions. 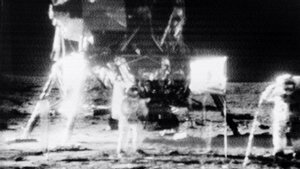 Apollo 11 astronauts Neil A. Armstrong and Edwin E. "Buzz" Aldrin, Jr. took photos of the moonscape, completed several scientific experiments, and collected and tested lunar rock samples during their limited EVAs on the moon. They set up two scientific experiments near their landing site in the Moon's Sea of Tranquility. 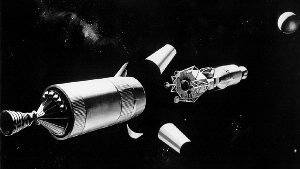 Called the Early Apollo Scientific Experiments Package (EASEP), the package consisted of a passive seismic experiment and a laser ranging retroreflector. A third experiment, a Solar Wind Composition Experiment, was deployed and returned to Earth by the crew for analysis by ground scientists. To learn more, visit the section on Science. Astronauts Armstrong and Aldrin completed the first EVA (extra-vehicular activity) on the surface of the moon in July 1969.